In September, World Trade Center Savannah announced its list of target countries. The target countries are: Canada, Germany, Ireland, Ghana, Japan and the United Kingdom. The countries selected hold the most potential based on existing assets, industries, connections, relationships and investment. 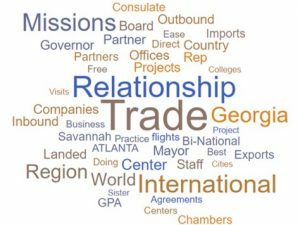 World Trade Center Savannah’s board and staff examined and evaluated dozens of criteria that directly affect international commerce throughout the region. The six-month long, in-depth and ongoing analysis used more than 20,000 data points, including both qualitative and quantitative information. The data covered a wide range of factors including raw import and export data, non-governmental entities facilitating trade, World Trade Centers’ presence, free trade agreements, airport access, already existing trade agreements, regional businesses with partnerships abroad and more. Georgia International Trade office in the U.K. The research conducted by WTCSav is a central and ongoing process at the core of the organization, as it shapes the direction for educational programs, trade services and outbound trade missions. The research will also be of value to WTCSav Economic Development Authority and Business Partners throughout the region as WTCSav works with them to evaluate this data in addition to supplementary figures based on their target industries and markets. For more information on the 2018 target countries, contact WTCSav Manager of Trade and Research, Jessie Bynum.